With snow forecast for lots of the UK, it’s time to talk safety. Specifically, how can we continue to run outside in snow, slush and ice without risking an accident or injury? The running4women team have braved many a Winter between us, so we’re ready to share our best bits of wisdom so you can keep on running, whatever the weather. 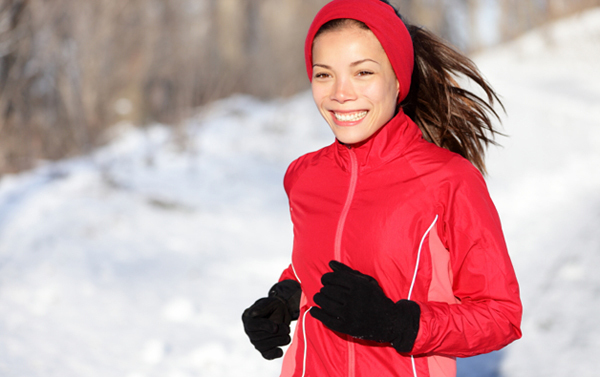 Your lovely lightweight Summer running shoes may not cut it in poor Winter weather. So consider investing in something with a more grippy, non-slip sole. If you’re heading off-road in Winter, remember that the ground will be a lot harder and at times won’t give at all, so think about whether or not your normal trail shoes will give your soles and ankles the support they may need. As a runner, you should always tell someone where you’re going and roughly how long you’ll be out, but this safety advice becomes even more crucial in Winter. There are just too many hazards around when the weather turns. Regular trails could become blocked by fallen trees or damaged fencing, roads may become impassable, and steep hills might have to be avoided when icy. Remember, you could be the safest and most sensible runner out there, but you can’t account for other road users. Winter weather presents a number of hazards which can spring up within hours. Black ice, hidden debris, stones washed into the road by rain, steep hills made slippery, smooth surfaces transformed into ice-rinks. Don’t take any risks. If you don’t think you should run on it, then don’t. Turn back, find another route, and tackle the run another day. Stay safe this Winter and don’t take unnecessary risks: we want to see you all still running injury-free by the time Spring comes around!